Welcome to our unique little hideaway. Secluded, serene, and perfectly located, our self-contained cottages have everything you need for a relaxing waterfront vacation. In the evening, just walk or paddle around to local dining and dancing. 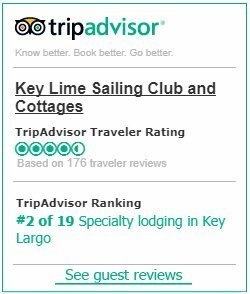 Or stay on site and enjoy Key Largo’s incredible sunsets from one of the area’s most intimate settings… the Key Lime Sailing Club & Cottages. Easy to reach, hard to forget! This was my 10th year of staying at KLSC in early March – it continues to be my vacation site of choice – and I’m already in the book or 2016. Great location, amenities and staff. It doesn’t get any better than this. Totally enjoyed our trip,staff was great, my wife had never sailed. She is hooked now, will be back soon, thank you for a great vacation. Can’t say enough about the staff, perfect! Enjoyed all the watercraft available for use, kids loved the place:) Really enjoyed our stay, Talofa was great, the people and staff really made the trip awesome! We had a fantastic time. All of the water equipment was awesome! It was so nice not to have to worry about bringing all of that stuff with us. Our home was also equipped with tons of movies and games. What an excellent option for a family to have. Thank you KLSC! We had a great time at KLSC. The staff was especially wonderful and attentive! We loved it there. Perfect for our family vacation. Not over commercialized and a great place to get outside and discover things! Out boys loved it. We were so pleasantly surprised at Key Lime North! Breathtaking, beautiful, and very hard to leave! Sandra, Nick, and Heather were wonderful, helpful, and will be our lifetime friends. Paulie made everything special including remembering birthdays and beyond! 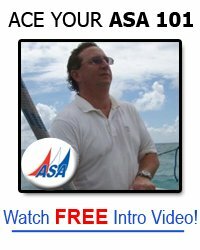 Captain Sheldon was a fantastic sailing instructor. Nothing beats this vacation! We LOVED our stay and your hospitality. Everyone went above and beyond to make the stay enjoyable, including John from Michigan who took us out in his sailboat one afternoon. That was definitely our treasure of the week, spending time visiting with him while sailing. Diamond in the rough, so glad we stayed! Definitely would book here again if the Keys were our destination.